Driven by aging electrical grids, severe weather and simple human error, power outages are increasing both in number and severity. Last year, more than 36 million people experienced power outages in the U.S. It is no surprise that power outages are the biggest driver of demand for home standby generators, making it critical to know about severe weather before it occurs to best serve and market to your customers. We have listed below several sources for monitoring power outages, as well as threats for your local area. Local Utility Company: The utility company in your area is a good resource for power outage information. Check your local utility company’s website to see if they offer severe weather alerts. We also suggest following their social media accounts; turn on post notifications for their accounts to ensure you receive the latest weather and outage alerts. PowerOutage.us: This online tracker pulls near real-time data from local utility companies across the country. We recently added this tracker to our homegenerators.cummins.com website (here). Severe weather is the leading cause of power outages. 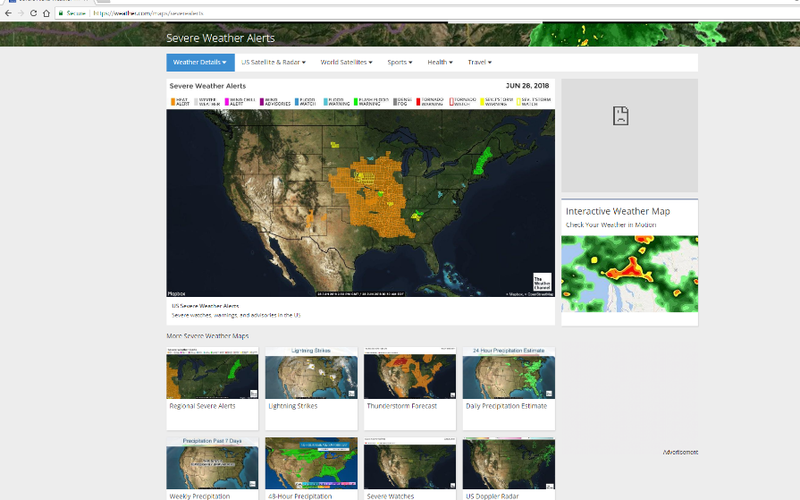 It is important to track severe weather before it hits to ensure you're prepared to connect with customers when the frustration of losing power is still fresh in their minds. AccuWeather Alerts:AccuWeather will email daily forecasts, as well as severe weather watches and warnings directly to you. These weather alerts provide you with a map detailing the area(s) likely to be affected, as well as details on the timing and impact of the weather. Clickhereto sign up. Eaton Power Outage Tracker: The Eaton Power Outage Tracker is a good source for historical power outage data across the U.S. It also provides the causes and impacts for each power outage. This tracker has not been updated this year, but allows you to see power outages since February 2008, so you can educate yourself on historical outages in your area. Clickhereto use the Eaton Blackout Tracker. The Weather Channel:Weather.comprovides information on lighting strikes, thunderstorms, hurricanes and other severe weather events. Like AccuWeather, it also allows you to sign up for severe weather alerts and updated information on weather conditions. Clickhereto learn more. I hope you learned a lot about power outages. In Dallas, we have lots of different storms that affect our electricity. I hope you will consider getting a standby home generator so we can better protect your home and your family. Call us today at, 214-207-0506. True Story . . . I attended to a network meeting last week only to find the electricity was out at the restaurant where we regularly meet! They said a transformer blew out, which happens more often than you would think. There was no rain or wind that morning, but it just popped and right at lunch time. It knocked out their electricity so they could not run their restaurant during some of their most busy times. How much money can a restaurant lose without electricity? First, let me give you some context of why I was meeting at Spring Creek. I meet with a business networking group on the 2nd and 4th Tuesday of every month. It is a great way to connect to other business leaders and eat some good BBQ. I have noticed at least two other small groups of people meeting on those same Tuesdays. In our group we had 12 people this week. Usually we see two other groups of 6 and 8 people. Then, we see people coming in and out all through our hour we are meeting. Just estimating (because I noticed how many people are coming and going), the line fills up at 15 people and it fills up about 10 times while we are there for one hour. That adds up to 150 people. At $10 a lunch plate and $2 a drink, the average is $1800 per hour, not including groups, larger order take-outs or desserts. (I ran these numbers by a person who used to run a restaurant and he confirmed my estimates are spot on.) This restaurant could have lost around $5000 over the course of lunch. And, if the electricity was out for supper, you can probably double that amount. In just one day they could have lost more money that it would have taken for them to install a permanent industrial generator for their restaurant. Of course, that cost does not even account for any food they had to throw out due to loss of refrigeration. It also does not account for workers who they had to pay since they showed up for work. Yikes, a power outage at a business can cost a lot of money very quickly! Backup generators keep a business up and running during a power outages preventing losses in revenue and productivity. If you have a business, I want you to seriously consider the cost of power going out for just a few hours. What if we have a big storm and it goes out for a few days?! I would love to chat with you about a permanent solution to help keep your business with power and keep your business making money. Call us at 214-207-0506.Wine enthusiasts know how important it is to keep your wine at just the right temperature. If your wine changes temperature for a short time, it will probably be ok. However, during a power outage, your wine could see drastic changes in temperature in a short span of time. That will not help your wine maintain its perfectly balanced flavor nor benefit your sensitive taste pallet that you have worked so hard to develop. So what can you do? When the power goes out, your wine will stay where it is and in that condition for a short time. If the power goes out for days, or in extreme weather, you may have something to worry about if you have spent time collecting just the right collection of wine for your sophisticated taste. The ambient temperature should keep for a few hours, but if the electricity is off for longer, your wine will begin to age and change temperatures. In the heat of summer or the dead cold of winter is when power outages are most likely to occur. However, power outages can occur at random intervals due to things as common as a squirrel. If you own a wine cabinet, you may be able to add a block of ice or wrap your wine with cool towels and keep it in a cool space. It can remain at that temperature of a couple of days provided you have a well-insulated cooling compartment. You will need to re-ice and clean up any excessive water to keep your wine at peak condition. (source) When the electricity goes out, it is best to protect any sensitive valuable. You can make a contingency plan in case of a power outage, or you can plan to protect your valuable asset with an insurance policy, or even better, prevent the loss by having a standby power generator. It is important to note that 25% of insurance claims for loss of wine come from power outages. (source) Whole house standby power generators can turn your electricity back on automatically within 20 seconds. That is not nearly enough time to affect your wine and should keep your valuables in perfect condition. Then, when it is time to open the bottle to enjoy it, it will be exactly what you expect: perfect smell, perfect taste, perfect feel on your well-developed taste pallete. If you want to protect your wine and your home, we would love to come by an give you a site assessment for a home generator. We will maintain your generator, so no matter what mother nature throws at you to knock out power, you will have your wine collection kept in tip top shape. Verdegy is here to help you protect your family and your valuables no matter what kind of bottle they come in. Give us a call at 214-207-0506. What you need to know about your dog or cat when the power goes out. You may not think your dog or cat will be affected by a power outage. After all, they can see better in the dark than we can, so everything should be fine, right? Not exactly. Read about how a power outage can affect your valued family member. First and foremost, animals pick up their cues from their owners. Your little canine or feline may become jumpy or reactive when the power goes out because you or a family member is agitated. If you are nervous about power outages, it’s safe to say your pet will be nervous as well. I read a story where a pet owner’s dog was picking up alarms from other parts of the block. The dog would jump on her head anytime a fire alarm would beep (story source). Remember, dogs and cats can hear frequencies that you and I would never hear. There is no telling what sounds carry when the electricity goes off in any particular area. Caring for pets during power outages. Keep in mind that you respond to temperature changes and your pets will too. They have become accustomed to the temperatures you set and drastic changes can affect them greatly. If it is getting cold in your house, use a blanket or something to keep them warm as well. If electricity is off in your area, you will need to have water from another source. Don’t forget about your pet as well. You want to keep water where they can access it and make sure it is not freezing over in the winter or evaporating in the summer. First, and this is vitally important, if a power line is down in your area, keep your pets in doors. They may not know how to react and touching a downed power line could cause death. Also, you want to make sure you keep a very similar routine for your pet. If you typically walk them, take them out or do any other daily or weekly activity with your pet, continue to do so. Uprooting their routines could cause undo stress. Here are some other tips for your pets during power outages. You may never have to worry again about power outages. Have you ever wondered what can knock out our power? We all expect to plug in our devices or turn on our light switch and they just magically work. That is not always true and if you haven’t experienced a power outage yet, you will! If you look at the graphic here, you will see that there are three main sections of the electrical grid and those are pretty much interconnected. If something major hit any one of these sections, it could knock out anything in the entire region. Yes, our electrical grid is that fragile. The power grid we all rely on is a pretty shaky system. It can take something as simple as a squirrel to knock out electricity for many blocks at one time. Some say there have been more power outages made by squirrels than cyber-attacks (Business Insider), but that won’t continue to be true. We have seen an increase of cyber-attacks in the current year. We can only expect that to continue to increase. With the tensions of North Korea and their statements that they will attack our grid, it could knock out power for millions. One electromagnetic pulse and our grid, as well as most of our electronics, come to a stand still. ( InHomelandSecurity) It may not be now, it may not be this year, but we do not have any way to combat the outside influences on our fragile electrical grid system. Anyone who would want to cripple our country or any city would just simply need to attack our electric system either with hacking, as in cyber-attackes, or EMPs. It is sad to think that both of those possibilities exist. What can we do about the unstable electrical grid? The key is PREPARATION. We must all prepare for the inevitable without going overboard and disrupting our lives. There are two ways to prepare. One, prepare to wait out times without electricity. Two, prepare to have an electrical alternative. The problem with preparing to wait for electricity to come back on is that you never know how long it can be off. How do you prepare for a week without electricity? How about if it lasts a month? Depending on how much damage happens or how severe the threat, the grid can go out for a long time. For most people, living a week without electricity will be unbearable. Think about small children and elderly. If it is in the dead of winter or the peak of summer, they could be in serious danger. Sad thing is those are the times most likely to have a power outage due to the serious load on the electrical grid. Many people have started installing solar panels and wind turbines. Those are some great systems and they help our electrical needs by saving fossil fuels. However, the technology we have it not reliable. They may produce some electricity, but storing it is a whole other aspect. We don’t have time in this article to go through the reasons, but they are not reliable unless you know how to build, maintain and fix them yourself…including an integrated long-term battery system. One of the best solutions is a home standby generator. With the advances in technology, it will not only turn on within seconds of a power outage, but it will sustain your current level of energy needs which you will not find in wind or solar power. I know a lot of people have the idea in their head of the old ‘pull string’ gas generators. You had to prime them, pull the string and hope the engine would kick on. Then, you couldn’t have it indoors because the fumes could kill you. They were loud and easy to steal. Today’s home standby generators are quiet and mounted to your current electrical panel. The install is simple for a trained technician. There is security in knowing that whether it is squirrels, sun spots or cyber-attacks, you have the power you need at a moment’s notice. Vedegy has partnered with Cummins Generators. They are one of the most reliable and durable generators in the world. We can help you assess your electrical needs and even lay out a plan for you and your loved ones. We offer full service, hand on installation. Plus, we a have a maintenance plan to keep your generator working for years and years to come. You’d be surprised at the return on investment. Not only will it increase the value of your home when you sell it, it will also save money from things like ruined food that happens during a power outage. Give us a call at 214-207-0506 if you are in the DFW area. We will come by and give you a free assessment based on your house and your needs. Ryan talked about the power of Cummins Home Generators for anyone in Dallas and why it is important to have back up power in the DFW area. It aired last month, but they had the wrong graphics. Here is the updated video. Of course, if you want to watch this program directly on Good Morning Texas, just follow this link. We were asked to do a special on Good Morning Texas to talk about why homeowners in Dallas would want a home generator. On Monday June 6th it aired. We thought you might want to see it so we are including it right here. Living in the 21st century has its perks; you can cover thousands of miles in a few hours, talk to your loved ones over long distances, entertain yourself through televisions and computers, and even drive to and fro from work in your electric car. Moreover, as opposed to your ancestors, you are blessed when it comes to electricity, whereby you receive an abundant supply of electric power in your home throughout the day. However, even with all the technological advances, mankind is still prone to the downsides of utilizing technology especially when talking about power outages. Many wonder why the power goes out, despite the so-called advanced world. Well, here are a few reasons why power breakdowns still occur. Nobody can deny the fury of Mother Nature; it’s that aspect of nature that can wreak havoc upon human beings and their belongings. The wrath of Mother Nature appears in the form of tornadoes, hurricanes, thunderstorms, earthquakes, tsunamis, gales, etc. This is true in Dallas where hurricanes, hailstorms, and tornadoes are common. The strong winds, heavy snows, hard rainfall, and ice storms can cause overhead power cables to snap and fall down. Moreover, gales can easily uproot trees, so why not power poles? They break them in the blink of an eye, causing them to fall and snap power lines. This is one of the most important reasons why the power goes out. Even underground cables are susceptible to damage during excessive rainfall which causes flooding. The water seepage causes them to short-circuit and burnout. They also get damaged during earthquakes. That’s why it’s important to have a home backup generator as technology still cannot stop the onslaught of Mother Nature. Sometimes, power utilities carry out maintenance work on substations, power lines, power poles, etc. for either repairing or replacing a damaged component like transformers, feeders, etc. Obviously, when they do this, they will shut off the power temporarily; they don’t want their workers to get exposed to high voltages and lose their lives! Such power outages are quite rare especially in Dallas, but nevertheless still happen and affect only a limited number of people. Hence, a home emergency generator is crucial in such circumstances. Apparently, there is no technology that cannot develop any faults, yet. Have you ever done something which you regretted later? Of course, we all have. And this is something which can be related to power breakdowns. Although quite rare, it still does take place and can become a nuisance for many people along with a serious lawsuit for the offender. If you receive electricity through underground power lines for example, there might come a time in your life when you have to see your power being cut off accidentally because someone forgot to place a call before digging to install a new pipeline, carry out road maintenance or perform maintenance on the cable itself. Therefore, it’s always better to own a whole house backup generator in such situations because no technology has been invented to prevent humans from making mistakes.In 2012, Hurricane Sandy was the worst and the deadliest hurricanes to hit the United States and as a result, there was a lot of damage including severe power outages which caused further infrastructural damage. Power outages are quite common in the city of Dallas, Texas and they can cause many problems. Some of them are discussed below. Without a home backup generator, refrigerators, freezers, and fridges stop working, causing your stored food to get spoiled. This results in hundreds of dollars of damage as you will eventually have to replace the spoiled food. If the heating systems stop working during winters, ice starts forming inside and outside the plumbing pipes and they might crack and burst, causing water leaks and seepages. Be ready to spend a fortune on extensive repairs! Unless you are a bat, you wouldn’t like to spend your night in darkness, forcing you to rent a room in a hotel or motel. This adds to your overall costs. Your house is vulnerable to scrupulous characters during a power outage. The risk of theft is high and you might have to replace your valuable belongings if they are stolen. What is a Home Standby Generator? Everyone has heard of generators, but what exactly is a home emergency generator? It is a permanent, cost-effective, reliable, turnkey, and long-term solution to a power outage. Such generators provide electric power independently during power breakdowns by utilizing a transfer switch to turn on the generator as soon as the sensor senses a loss of electric power. Since the entire process is automatic, the electrical load is transferred instantly to the generator, thus supplying an uninterrupted electrical supply to your home. Whole house backup generators are installed outside your home. Home backup generators have many benefits and advantages. Let’s take a look at how they can help during a major power outage. You don’t have to do anything. The generator is automated and turns on automatically as soon as the power breaks down, therefore providing uninterrupted electrical power to your home. In the event of hurricanes, tornadoes or thunderstorms, your home’s basic HVAC, lighting, and refrigeration systems operate normally. It reduces any financial losses that may arise due to power breakdowns. For example, your freezer and refrigerator keeps working, thus preventing stored food from rotting. The thermostat and heating system will operate sufficiently, thereby averting the threat of pipes cracking and bursting during winters. These generators can easily power a house for many days after a major power outage, protect your electrical appliances from voltage fluctuations and surges, and keep you and your family safe from robbers during power breakdowns. I received this helpful article via email from Cummins and would like to share it with our valuable customers. It is important to keep up with power outages. If you notice power outages in your area, it is only a matter of time before your power goes out. If you want the security of not having to worry about power outages, you should call us for a free site assessment, 214-207-0506. PowerOutage.us: This online tracker pulls near real-time data from local utility companies across the country. We recently added this tracker to our homegenerators.cummins.com website (here). Severe weather is the leading cause of power outages. It is important to track severe weather before it hits to ensure you’re prepared to connect with customers when the frustration of losing power is still fresh in their minds. True Story . . . I attended to a network meeting last week only to find the electricity was out at the restaurant where we regularly meet! They said a transformer blew out, which happens more often than you would think. There was no rain or wind that morning, but it just popped and right at lunch time. It knocked out their electricity so they could not run their restaurant during some of their most busy times. First, let me give you some context of why I was meeting at Spring Creek. I meet with a business networking group on the 2nd and 4th Tuesday of every month. It is a great way to connect to other business leaders and eat some good BBQ. I have noticed at least two other small groups of people meeting on those same Tuesdays. In our group we had 12 people this week. Usually we see two other groups of 6 and 8 people. Then, we see people coming in and out all through our hour we are meeting. This restaurant could have lost around $5000 over the course of lunch. And, if the electricity was out for supper, you can probably double that amount. In just one day they could have lost more money that it would have taken for them to install a permanent industrial generator for their restaurant. Of course, that cost does not even account for any food they had to throw out due to loss of refrigeration. It also does not account for workers who they had to pay since they showed up for work. Yikes, a power outage at a business can cost a lot of money very quickly! My friend, who is a business owner decided to compare quotes for his electricity while the power was working as it should and saved a bunch of money. Usave got him his quote. read this to find out more. Backup generators keep a business up and running during a power outages preventing losses in revenue and productivity. If you have a business, I want you to seriously consider the cost of power going out for just a few hours. What if we have a big storm and it goes out for a few days?! I would love to chat with you about a permanent solution to help keep your business with power and keep your business making money. Call us at 214-207-0506. Wine enthusiasts know how important it is to keep your wine at just the right temperature. If your wine changes temperature for a short time, it will probably be ok. However, during a power outage, your wine could see drastic changes in temperature in a short span of time. That will not help your wine maintain its perfectly balanced flavor nor benefit your sensitive taste pallet that you have worked so hard to develop. So what can you do? When the power goes out, your wine will stay where it is and in that condition for a short time. If the power goes out for days, or in extreme weather, you may have something to worry about if you have spent time collecting just the right collection of wine for your sophisticated taste. The ambient temperature should keep for a few hours, but if the electricity is off for longer, your wine will begin to age and change temperatures. In the heat of summer or the dead cold of winter is when power outages are most likely to occur. However, power outages can occur at random intervals due to things as common as a squirrel. Whole house standby power generators can turn your electricity back on automatically within 20 seconds. That is not nearly enough time to affect your wine and should keep your valuables in perfect condition. Then, when it is time to open the bottle to enjoy it, it will be exactly what you expect: perfect smell, perfect taste, perfect feel on your well-developed taste pallete. If you want to protect your wine and your home, we would love to come by an give you a site assessment for a home generator. We will maintain your generator, so no matter what mother nature throws at you to knock out power, you will have your wine collection kept in tip top shape. Verdegy is here to help you protect your family and your valuables no matter what kind of bottle they come in. Give us a call at 214-207-0506. First and foremost, animals pick up their cues from their owners. Your little canine or feline may become jumpy or reactive when the power goes out because you or a family member is agitated. If you are nervous about power outages, it’s safe to say your pet will be nervous as well. I read a story where a pet owner’s dog was picking up alarms from other parts of the block. The dog would jump on her head anytime a fire alarm would beep (story source). Remember, dogs and cats can hear frequencies that you and I would never hear. There is no telling what sounds carry when the electricity goes off in any particular area. First, and this is vitally important, if a power line is down in your area, keep your pets in doors. They may not know how to react and touching a downed power line could cause death. Also, you want to make sure you keep a very similar routine for your pet. If you typically walk them, take them out or do any other daily or weekly activity with your pet, continue to do so. Uprooting their routines could cause undo stress. Here are some other tips for your pets during power outages. If you would like to make sure your dog or cat does not have any issues during a power outage, just avoid power outages. While you may not be able to avoid the power going out, you can make sure it comes back on in as little as 20 seconds with a whole house power generator. These generators are quiet and can power your entire house keep your furry family and the rest of your family safe and secure during power failures. Verdegy is here to help you protect your family no matter how furry they may be. Give us a call at 214-207-0506. What happens to aquariums when the power goes out? Power outages can drastically affect your delicate aquarium environment. Are you prepared? If power is only out for a short time, you may be OK if you have a large enough tank, the right environment and minimal fish. However, what happens if the power goes out for longer than an hour or two? It is a harsh reality that aquariums need electricity to function. Power runs things like the lights, air pumps, powerheads, skimmers, feeders, etc. All of these things work together to create a healthy environment for your fish. When those things do not have power, your fish will suffer. We all want healthy, happy fish and in order to attain that, we need to have proper power. Many tanks can last for an hour, but larger or well stocked aquariums can have considerable problems after just one hour. With oxygen levels and temperature changes your fish will be in stress quite quickly. Not to mention the buildup of toxins and harmful bacteria that can happen. Some say adding a portable generator will help, but you can not expect to be at the house each time a power outage happens. That is why having a standby home generator can be very beneficial for protection your fish. What happens to your aquarium when power goes out? There are two major changes that can drastically affect your fish. Either of these events by themselves can hurt your fish, but together they can be detrimental to the fragile system you have created in your aquarium. Fish thrive in consistent and stable environments. Without additional measures, your entire ecosystem can become dangerous to your fish in a matter of a couple of hours. For temperature changes, you can add warm water or ice as needed, but these must be done very carefully. Little changes and constant monitoring are crucial. For oxygen, plants can help, but when the power is out so are the lights that are powering the plant (no pun intended). Plants need light in order to function properly and they will quickly stop producing in a darkened environment. What about my salt water aquarium in a power outage? Isn’t it safer? “There are certain functions in a saltwater aquarium which are essential for its survival: gas exchange and water movement. Even the most sensitive corals in a reef tank can survive for days without intense light, but the viability of fish, invertebrates, corals and beneficial bacteria deteriorates rapidly without a reasonable supply of oxygen. Second, do not feed your fish during a power outage. Feeding your fish can produce waste. That waste will make a great impact on the quality of your water, especially since the water circulation will not be active. You may not know this, but most fish can go 3-5 days without food so there is no reason to worry about not feeding them for a couple of days. If your power is out for more than a couple of hours you want to restore the environment for your fish as quickly as possible. You may have enough time to run to your local home improvement store to find a power generator . . .that is if they power goes out at a convenient time. Many power outages happen in inconvenient times. Having a solution at hand will be your best option. You can pre-purchase a solution rather is a power generator or a battery pack. Either way, you will need to be present to start these items up and make sure they are maintained properly. The BEST solution is to have a power source you don’t have to think about. You have worked hard to create just the right aquarium for your home and the perfect environment for your fish. Having a home standby generator gives you peace of mind that if the power goes out, in a matter of seconds it is automatically restored without you having to think about it. At Verdegy, we have committed to the highest quality of Cummins generators. Usually in 10-20 seconds these whole house stand by generators will start your electricity back up as if nothing ever happened. Imaging the time and money you will save when you don’t have to worry about your aquarium when the power goes out. There are much more we can talk about when power goes out, but we want to offer you a free consultation. If you live in the DFW area, we will come out and assess your needs to make sure you are prepares when power outages happen. In North Texas, it is not a matter of if your power goes out, but when. Give us a call at 214-207-0506 and let us help you keep your aqarium healthy and your fish happy. How Do Power Outages Happen? We all expect to plug in our devices or turn on our light switch and they just magically work. That is not always true and if you haven’t experienced a power outage yet, you will! If you look at the graphic here, you will see that there are three main sections of the electrical grid and those are pretty much interconnected. If something major hit any one of these sections, it could knock out anything in the entire region. Yes, our electrical grid is that fragile. It may not be now, it may not be this year, but we do not have any way to combat the outside influences on our fragile electrical grid system. Anyone who would want to cripple our country or any city would just simply need to attack our electric system either with hacking, as in cyber-attackes, or EMPs. It is sad to think that both of those possibilities exist. The key is PREPARATION. We must all prepare for the inevitable without going overboard and disrupting our lives. There are two ways to prepare. One, prepare to wait out times without electricity. Two, prepare to have an electrical alternative. The problem with preparing to wait for electricity to come back on is that you never know how long it can be off. How do you prepare for a week without electricity? How about if it lasts a month? Depending on how much damage happens or how severe the threat, the grid can go out for a long time. For most people, living a week without electricity will be unbearable. Think about small children and elderly. If it is in the dead of winter or the peak of summer, they could be in serious danger. Sad thing is those are the times most likely to have a power outage due to the serious load on the electrical grid. With the advances in technology, it will not only turn on within seconds of a power outage, but it will sustain your current level of energy needs which you will not find in wind or solar power. I know a lot of people have the idea in their head of the old ‘pull string’ gas generators. You had to prime them, pull the string and hope the engine would kick on. Then, you couldn’t have it indoors because the fumes could kill you. They were loud and easy to steal. Today’s home standby generators are quiet and mounted to your current electrical panel. The install is simple for a trained technician. There is security in knowing that whether it is squirrels, sun spots or cyber-attacks, you have the power you need at a moment’s notice. Vedegy has partnered with Cummins Generators. They are one of the most reliable and durable generators in the world. We can help you assess your electrical needs and even lay out a plan for you and your loved ones. We offer full service, hand on installation. Plus, we a have a maintenance plan to keep your generator working for years and years to come. You’d be surprised at the return on investment. Not only will it increase the value of your home when you sell it, it will also save money from things like ruined food that happens during a power outage. Give us a call at 214-207-0506 if you are in the DFW area. We will come by and give you a free assessment based on your house and your needs. Power Grid Vulnerability: Why Would the Power Go Out in Our Technological World? Living in the 21st century has its perks; you can cover thousands of miles in a few hours, talk to your loved ones over long distances, entertain yourself through televisions and computers, and even drive to and fro from work in your electric car. Moreover, as opposed to your ancestors, you are blessed when it comes to electricity, whereby you receive an abundant supply of electric power in your home throughout the day. However, even with all the technological advances, mankind is still prone to the downsides of utilizing technology especially when talking about power outages. Many wonder why the power goes out, despite the so-called advanced world. Well, here are a few reasons why power breakdowns still occur. Nobody can deny the fury of Mother Nature; it’s that aspect of nature that can wreak havoc upon human beings and their belongings. The wrath of Mother Nature appears in the form of tornadoes, hurricanes, thunderstorms, earthquakes, tsunamis, gales, etc. This is true in Dallas where hurricanes, hailstorms, and tornadoes are common. The strong winds, heavy snows, hard rainfall, and ice storms can cause overhead power cables to snap and fall down. Moreover, gales can easily uproot trees, so why not power poles? They break them in the blink of an eye, causing them to fall and snap power lines. This is one of the most important reasons why the power goes out. Even underground cables are susceptible to damage during excessive rainfall which causes flooding. The water seepage causes them to short-circuit and burnout. They also get damaged during earthquakes. That’s why it’s important to have a home backup generator as technology still cannot stop the onslaught of Mother Nature. Sometimes, power utilities carry out maintenance work on substations, power lines, power poles, etc. for either repairing or replacing a damaged component like transformers, feeders, etc. Obviously, when they do this, they will shut off the power temporarily; they don’t want their workers to get exposed to high voltages and lose their lives! Such power outages are quite rare especially in Dallas, but nevertheless still happen and affect only a limited number of people. Hence, a home emergency generator is crucial in such circumstances. Apparently, there is no technology that cannot develop any faults, yet. Have you ever done something which you regretted later? Of course, we all have. And this is something which can be related to power breakdowns. Although quite rare, it still does take place and can become a nuisance for many people along with a serious lawsuit for the offender. If you receive electricity through underground power lines for example, there might come a time in your life when you have to see your power being cut off accidentally because someone forgot to place a call before digging to install a new pipeline, carry out road maintenance or perform maintenance on the cable itself. Therefore, it’s always better to own a whole house backup generator in such situations because no technology has been invented to prevent humans from making mistakes. In 2012, Hurricane Sandy was the worst and the deadliest hurricanes to hit the United States and as a result, there was a lot of damage including severe power outages which caused further infrastructural damage. Power outages are quite common in the city of Dallas, Texas and they can cause many problems. Some of them are discussed below. Everyone has heard of generators, but what exactly is a home emergency generator? It is a permanent, cost-effective, reliable, turnkey, and long-term solution to a power outage. Such generators provide electric power independently during power breakdowns by utilizing a transfer switch to turn on the generator as soon as the sensor senses a loss of electric power. Since the entire process is automatic, the electrical load is transferred instantly to the generator, thus supplying an uninterrupted electrical supply to your home. Whole house backup generators are installed outside your home.